I just wanted to share with you the totals for 2009 for USA Shipments to our COTN countries and celebrate God's blessing to send these supplies for all of our children. 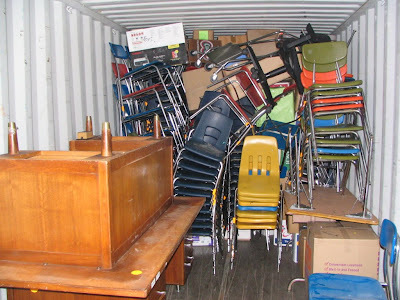 For comparison, in 2008 we sent 4 containers totaling 91,098 pounds of supplies. 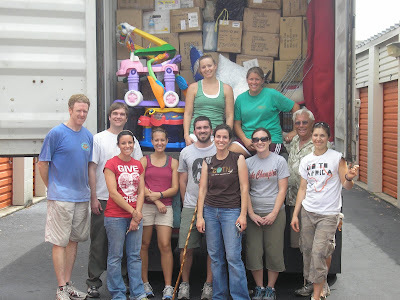 In 2009, we sent 10 containers totaling 279,806 pounds of supplies. Shoreline Schools donated 6 containers full of school supplies for our overseas classrooms - THANK YOU Sharon Suver-Jones, Darryl Reed and Shoreline Schools. Coordination to send the supplies for 6 classrooms - THANK YOU Wendy Brown, Crystal Olp, Kim Witte and the team at the Global Book Club. Donated Storage Space from Kennedy Business Park - THANK YOU Abe & Kay Young. 2010 looks promising, and I hope to celebrate more shipments with all of you! "Raising children who transform nations in Sierra Leone , Malawi , Uganda and the Dominican Republic "